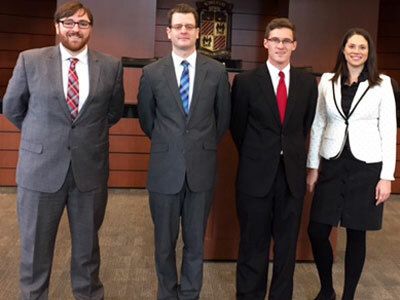 The NIU College of Law team advanced to the quarterfinals of the Midwestern Regional Jessup International Moot Court Competition, held from Feb. 4 through Feb. 7 at Loyola University School of Law in Chicago. NIU Law students Nick Atwood, Christine Beaderstadt, John McWard and Lucas Park were coached by professors Heidi Kuehl and Annie Mentkowski. Atwood, Beaderstadt, McWard and Park finished seventh of 20 teams at the Midwestern Regional. NIU beat out teams from law schools at the University of Wisconsin, DePaul University and Western Michigan University. The NIU Law team bowed out after a strong showing against the eventual champions of the competition from Case Western Reserve University School of Law. Case Western chose the combination of Beaderstadt and McWard to argue for the applicant memorial in the Feb. 6 quarterfinal round. The pairing of Park and Atwood also had very consistent scores throughout the competition. The Jessup is a highly-regarded and rigorous moot court competition. During each round, both the applicant and respondent sides prepare a 35- to 50-page memorial and then present the memorials in a moot court experience that mimics advocating in front of the International Court of Justice. Rounds last for two hours, and the NIU Law team argued in four preliminary rounds as well as the quarterfinal.